Dash of Inspiration: Prepare for the Holidays! Be sure to update card fronts with 2015 and for New Year 2016. Don’t forget to follow through with each card’s updating by fixing and improving your Card Title, Keywords and Artist Notes. If you offer photo cards and/or custom front text on these cards, consider taking the time to update the year in the custom tool. Remember customers shop visually first and not all realize they may change the year themselves. Don’t forget other holidays which occur during the festive season. 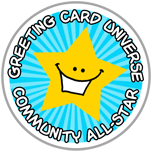 If you have cards for Halloween, Thanksgiving, Hanukkah, or Kwanzaa for example – be sure to update those too. It’s also time to be thinking of new designs for the upcoming season, and the perfect time to give those very old holiday cards a new lease on life with some design fine tuning and meta-tag data upgrades. Whether you like it or not, as a greeting card designer July is the month when you need to be in full holiday mode to be ready for the shoppers! Remember to check out the July Dash of Inspiration Design Challenge and join in this month’s theme; PEACE. So until next week … Learn … Create … Inspire!